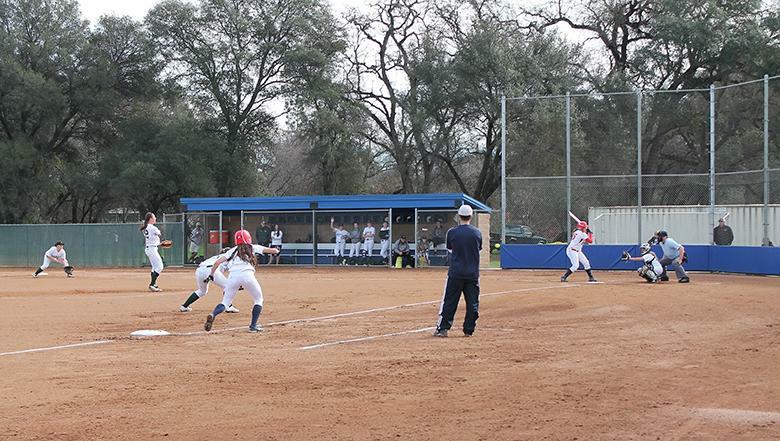 American River College’s softball team won its first game of the season Tuesday Feb.10, outlasting Shasta College 9-7 by taking advantage of Shasta’s errors in the sixth inning while starting pitcher Sharie Albert threw a complete game in the team’s home opener, only five days after making her first career college start. “It feels really good. It’s only going up from here,” said Albert on her performance. Albert struggled to start the game, giving up three first-inning runs including a two-run homer to Shasta designated hitter Hailee Nichols. ARC would get on the board in the second inning thanks to a solo home run by Jennifer Woo, and though Shasta scored again in the top half the third inning, ARC would push three across the plate in the bottom frame to tie the game at 4-4. With the bases loaded, ARC’s Darian Garnett hit a fly ball to left center field that appeared to be catchable, but dropped in after Shasta outfielders Leah Holland and Cheyenne King collided while attempting to make the catch, cutting the score to 4-3. Neither Shasta player was hurt during the collision. Albert followed by hitting a comebacker to Shasta pitcher Kayla Spini, who did not field the ball cleanly and allowed the runner to score. Nichols homered again for Shasta in the top of the fifth inning, and ARC would tie the game up again in the bottom half on a Cindy Van Bogart double to score Albert. ARC Head Coach Lisa Delgado praised her team’s play, but was particular in noting Van Bogart’s steady improvement. “I am so happy with the way Cindy Van Bogart is playing. It’s great watching her grow as a player,” said Delgado. Shasta would never regain the lead, and ARC pounced on Shasta’s miscues in the sixth, scoring four runs to take a 9-5 lead. ARC scored the go-ahead run on an infield single by Audrianna Burlew, and after another run crossed the plate, Albert capped the inning with a two-run single to center to extend the lead to 9-5. “I just saw a good pitch, and once I see that I’m just going to go for it,” said Albert on the big hit. Delgado has stressed timely hitting to her team even before the season began, and was happy to see it finally take place. Albert would give up two runs in the top of the seventh, but persevered to finish the game off on the mound. Albert said her mentality is what really dictates play. Be the first to comment on "Softball wins first game of season as Albert goes the distance"